Kursunlu Waterfall is a unique place where a cascade connecting seven ponds falls over an 18-metre height against a backdrop of green nature. 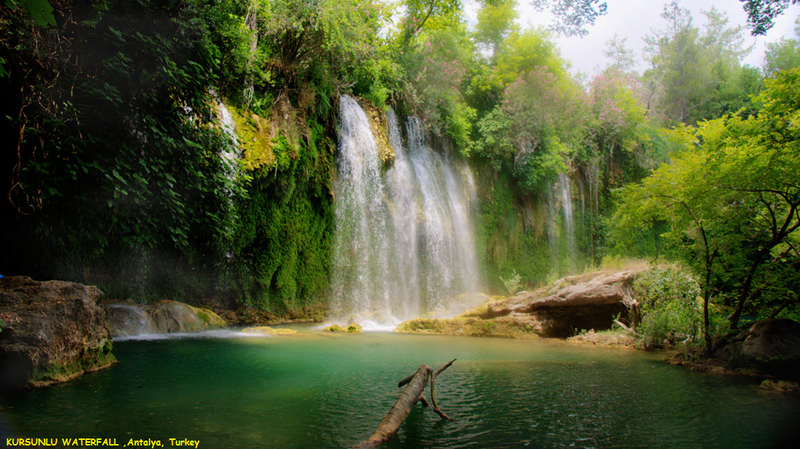 It is one of the most attractive landscapes in terms of lush plants and small or big various picnic areas in Antalya. Kursunlu Waterfall is on a terrain rich in flora amongst the pine trees 7 km ahead when turned to left at the 24th km of the Antalya-Mersin road. A canyon for 2 km shapes the environs of the waterfall falls front 18 m where 7 small lakes connect each other through small falls. The area is open to visitors since 1986. Waterfall and picnic area cover 33 hectares of land. Kursunlu Waterfall falls from about 10 m and forms a small pool where fresh water tortoises, crabs and fish live in. A small mill restored during the environmental arrangements is located in the west side of the area. Picnic area provides picnic comfort with the fountains, seats, grills and playgrounds.